If a secret piece of news is divulged by a spy before the time is ripe, he must be put to death, together with the man to whom the secret was told. Information security is important thing in internet nowadays, when you deliver information over internet. It has a lot of possibility tapped, changed, or others harmful things. There are a lot of way to secure your information that delivered, using secure application that encrypted from client apps to server apps. Or securing your traffic in IP network level that we called IP Security or IPSec. Secure Network was defined in RFC 1636 - Security in the Internet Architecture, this accomplished to prevent unauthorized monitoring and control of traffic and also to secure end-user-to-end-user traffic using authentication and encryption mechanism. IP-level Security encompasses three functional area: authentication, encryption due confidentially, and key management. The authentication has responsibility to ensure the "sender" and “receiver” has a right to transmitted and received packet. Encryption make sure the packet keep secure and prevent to eavesdropping by third party. And the last is key management that concerned for secure key exchange. 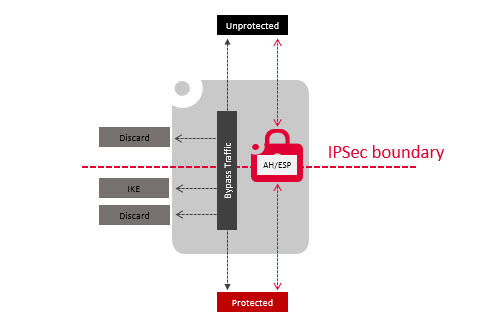 IPSec create boundary between protected and unprotected network. Traffic traversing the boundary is a subject to access controls that specified by user or administrator responsible for IPSec configuration. From the control, the traffic maybe cross the boundary with afforded security services via AH or ESP, or are discarded. Fundamental of IPSec service is the concept of security policy that determined by two database. Those are, Security Policy Database (SPD), and Security Association Database (SAD). This policy applied to each IP packet that transit from a source to a destination. 2. Sequence Number Counter: A 32-bit value used to generate the Sequence Number field in IPSec Protocol headers. 6. ESP Information: Encryption and authentication algorithm, keys, initialization values, key lifetimes, and related parameters being used with ESP (required for ESP implementations). 4. Name: A user identifier from the operating system. This is not a field in the IP or upper-layer headers but is available if IPsec is running on the same operating system as the user. 5. Local and Remote Ports: These may be individual TCP or UDP port values, an enumerated list of ports, or a wildcard port. IPSec using protocol Authentication Header (AH), and Encapsulation Security Payload (ESP), to provide traffic security services. Both protocols are described in detail in their respective RFCs [4303, 4302]. The IP Authentication Header (AH) offers integrity and data origin authentication, with optional (at the discretion of the receiver) anti-replay features. The Encapsulating Security Payload (ESP) protocol offers the same set of services, and also offers confidentiality. ESP can work with a variety of encryption and authentication algorithms, including authenticated encryption algorithms such as GCM. Both AH and ESP offer access control, enforced through the distribution of cryptographic keys and the management of traffic flows as dictated by the Security Policy Database. Commonly, ESP using in Virtual Private Network or underlay network context, and we will focus with this protocol than Authentication Header. Because in service provider network, we often meet this kind of protocol. Security Parameters Index (32 bits): Identifies a security association. Sequence Number (32 bits): A monotonically increasing counter value; this provides an anti-replay function, as discussed for AH. Payload Data (variable): This is a transport-level segment (transport mode) or IP packet (tunnel mode) that is protected by encryption. Padding (0–255 bytes): The purpose of this field is discussed later. Pad Length (8 bits): Indicates the number of pad bytes immediately preceding this field. Next Header (8 bits): Identifies the type of data contained in the payload data field by identifying the first header in that payload (for example, an extension header in IPv6, or an upper-layer protocol such as TCP). Integrity Check Value (variable): A variable-length field (must be an integral number of 32-bit words) that contains the Integrity Check Value computed over the ESP packet minus the Authentication Data field. IPSec is executed on a packet on packet-by-packet basis. 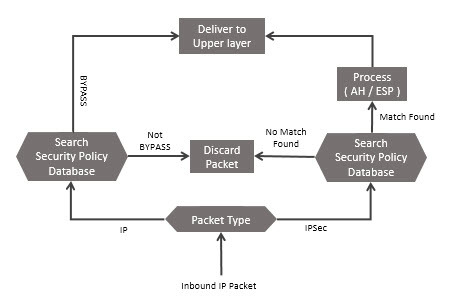 When IPSec implemented, each outbound packet is processed by IPSec logic before transmission. The Packet that sent must be consulted with the Security Policy Database (SPD) (or associated caches). 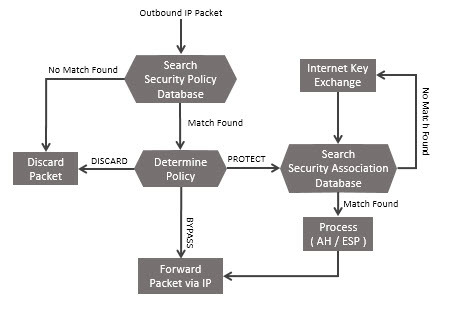 If no policy is found in the SPD that matches a packet (for either inbound or outbound traffic), the packet MUST be discarded, vice versa. There are many ways to implement IPSec in host, or conjunction with firewall or router to create security gateway. 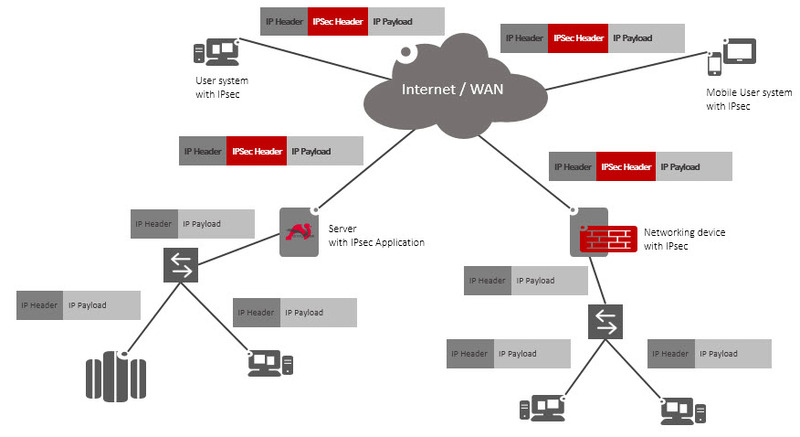 IPSec may integrated into the native IP stack with access the IP source code. IPSec may in a “bump-in-the-stack” (BITS) implementation, IPsec is implemented "underneath" an existing implementation of an IP protocol stack, between the native IP and the local network drivers. Or "bump-in-the-wire" (BITW) implementation. Where IPSec put in inline security protocol processor. 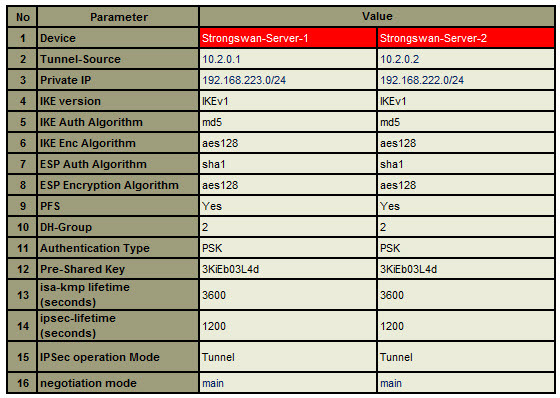 StrongSwan is an Open Source IPsec implementation. It was originally based on the discontinued FreeS/WAN project and the X.509 patch that we developed. In order to have a stable IPsec platform to base the extensions of the X.509 capability on, we decided to launch the strongSwan project in 2005. Since then a new IKE daemon has been written in a modern object-oriented coding style so that the current code base does not share code with its ancestor anymore. Initially that daemon only supported IKEv2, while IKEv1 was handled by an extended version of FreeS/WAN's Pluto daemon. But because adoption of IKEv2 by other vendors took longer than anticipated support for IKEv1 was added to the new daemon with strongSwan 5.0.0. The maintainer of the strongSwan project is Andreas Steffen, who is a professor for security in communications and head of the Institute for Internet Technologies and Applications at the University of Applied Sciences Rapperswil in Switzerland and president of the consulting firm strongSec GmbH. For lab test, I using CentOS Operating System. There are limitation in system, The CentOS/RHEL repo's only ship Libreswan. Strongswan shipped in EPEL project from fedora. Extra Packages for Enterprise Linux (or EPEL) is a Fedora Special Interest Group that creates, maintains, and manages a high quality set of additional packages for Enterprise Linux, including, but not limited to, Red Hat Enterprise Linux (RHEL), CentOS and Scientific Linux (SL), Oracle Linux (OL). Before we use this, let me share how to install it. As information described point 1.2.2, Strongswan need epel repo to run in RHEL/CentOS. In strongswan, Pre-Shared Key is created in ipsec.secrets file. Creat ipsec.secrets file and add your secreet in it. Enabling IP forwarding in CentOS, we need it because strongswan put the ip traffic processing in different ip rule show in operating system. Strongswan reserved kernel routing in 220 routing database, each strongswan ipsec established, route mapping will install in this Routing Database. After establish information. Check the route was installed and do ping test. PING 192.168.222.101 (192.168.222.101) 56(84) bytes of data. could you make a tutorial for strongswan with site-to-site ipv6 based network? What knind of operating system do you use? could you make it with CA authentication? Cost-effective templatized interactivities and self-contained learning objects are two of the major attributes of K-12 content development. Besides, Interactive White Board (IWB) based applications are developed by companies. really you have posted an informative blog. it will be really helpful to many peoples. thank you for sharing this blog. Thanks for sharing this article with codes really nice. Strongswan VPN seems good though I didn't use if for a while. But after reading this article I'm so much interested to use this. Though I knew about VPN connection from here: https://www.vpnsrus.com/netflix-proxy-error-fix/. BTW thanks for sharing this great article with codes. Hope this codes will work properly. With web security treats popping left and right, picking the best VPN benefit is critical With web security treats popping left and right, picking the best VPN benefit is critical in guaranteeing that your business and your own data are not hacked or noxiously conveyed on the web. popcorn time in guaranteeing that your business and your own data are not hacked or noxiously conveyed on the web. This article goes hand in hand with information on bestvpnrating.com. And it's overwelmed with techical aspects here. You would get much more views if you simplified it a bit. Amazing and excellent! I loved the experience. hi, thank you for the tutorial, but i have a some cases. 1. i do some testing , i stop strongswan service on one site and wait for a few minutes, when i started strongswan again, the connection between two sites still not established. 2. some time, the connection is closed by its own, i can not ping from one site to the other site, so i have to restart strongswan service from both sites. Thanks for taking time to share this page, it is really helpful and I learned a lot from your blog. Continue sharing more like this. Wow. It is an amazing blog. Thank you for sharing this useful information. You have done a great job by posting this. Keep up the good work. Thank you for sharing this useful information. I got more information in this blogs comment. Your site was awesome. keep update on some more tutorials…..
Moreover,BUSINESS MUT individuals will feel miserable or considerably endure on the off chance that they are in a state more regrettable than others. Along these lines, each individual has a sense to contend. In your blog I was happy to see your article, better than last time, mallya aditi international school fees and have made great progress, I am very pleased. I am looking forward to your article will become better and better. I was reading some of your content on this website and top school of delhiI conceive this internet site is really informative ! Keep on putting up.